Tom Conroy returns to talk about Doug Wildey (1922-1994). This is Quincannon of Company C, samples for a full-page Sunday comic strip Doug Wildey tried to sell to the syndicates. Quincannon was his version of Warren Tufts' Lance strip. The syndicates were not interested. I knew Wildey when I was a teenager in Tucson, and he gave them to me in 1958 or 1959. These three strips are 7 1/2 x 10 1/4 inch photostats that I had glued in a scrapbook nearly 50 years ago. When I first met Wildey he was drawing The Saint newspaper strip and was no longer doing The Outlaw Kid for Stan Lee, so I guess this was 1958/59. He showed me some of the Steve Canyon daily strips he had worked on for Milton Caniff. He drew the strip for about three months. His studio was filled with stacks of movie stills that he used for swipes. He bought them all while living in New York. He gave me a couple original pages of art that I still have somewhere in this warehouse I live in. 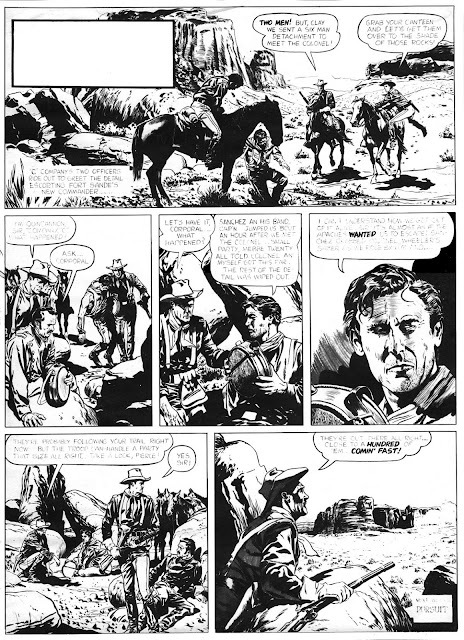 One is a drawing of Richard Boone from Have Gun Will Travel television show, which he also tried to sell as a comic strip. 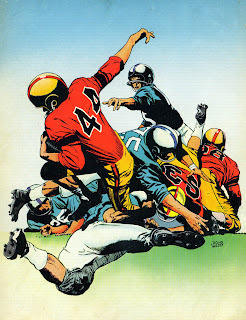 Another is a drawing of football players. He had done some artwork for a guy that printed programs for sporting events. I visited him about a half a dozen times. and he always made me feel at home. He and his wife were really nice people. Wildey was a jazz fan and would drive to Phoenix when Art Farmer and others were in town. He always told me he was buddies with L.B. Cole, and when I went to New York to be a cartoonist I heard that Cole was an editor at Dell. On one of my hitchhike trips back to Tucson I called Wildey and told him where Cole was working. Wildey contacted him and got a job drawing one of those television comics. As I recall, it was The Detectives with Robert Taylor. Doug Wildey was another one of those guys that got better with age. The older he got, the better he got. 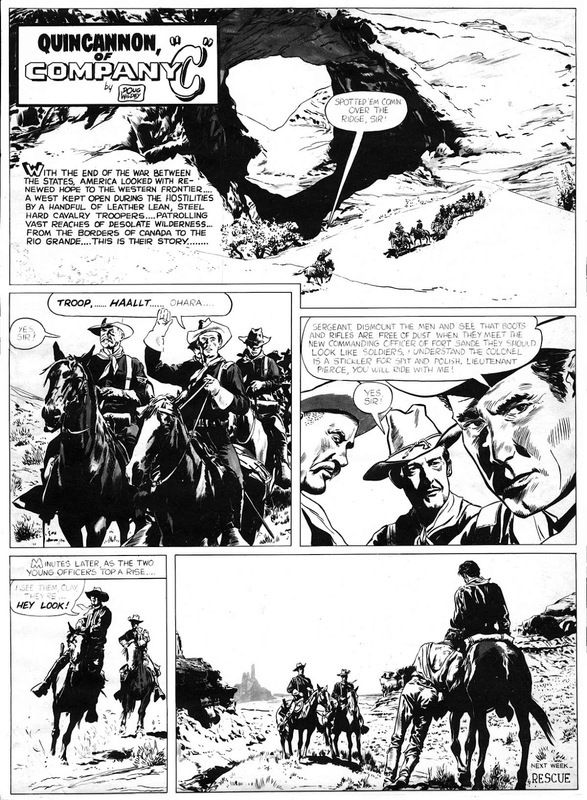 I think his Rio comics were some of the best Westerns ever done. 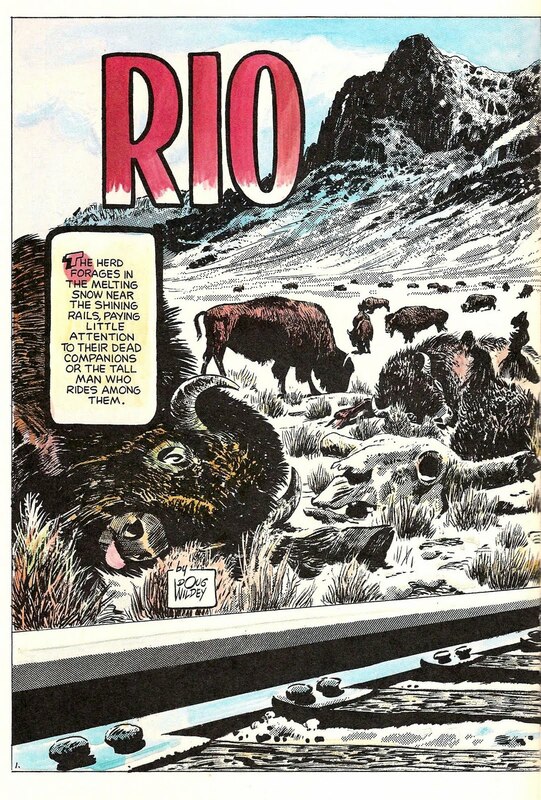 I agree that Rio is one of the best Doug Wildey books, I bought it when it was first published. Also, being a HGWT fan, I'd love to see that illustration of Richard Boone. 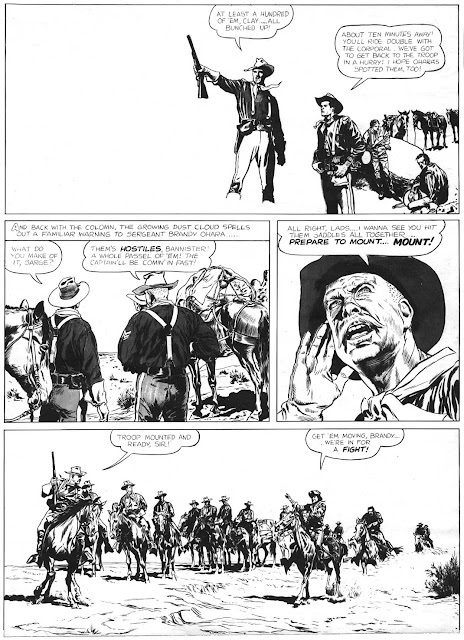 These pages Mr. Wildey gifted you with are fantastic. How wonderful to have shared a friendship. I've been a big fan of Doug Wildey's for many years. I've been trying to pin down exactly when he worked on Steve Canyon...any clues would be greatly appreciated!